For climate risk management, cumulative distribution functions (CDFs) are an important source of information. They are ideally suited to compare probabilistic forecasts of primary (e.g. rainfall) or secondary data (e.g. crop yields). Summarised as CDFs, such forecasts allow an easy quantitative assessment of possible, alternative actions. Although the degree of uncertainty associated with CDF estimation could influence decisions, such information is rarely provided. 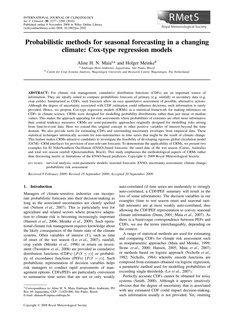 Hence, we propose Cox-type regression models (CRMs) as a statistical framework for making inferences on CDFs in climate science. CRMs were designed for modelling probability distributions rather than just mean or median values. This makes the approach appealing for risk assessments where probabilities of extremes are often more informative than central tendency measures. CRMs are semi-parametric approaches originally designed for modelling risks arising from time-to-event data. Here we extend this original concept to other positive variables of interest beyond the time domain. We also provide tools for estimating CDFs and surrounding uncertainty envelopes from empirical data. These statistical techniques intrinsically account for non-stationarities in time series that might be the result of climate change. This feature makes CRMs attractive candidates to investigate the feasibility of developing rigorous global circulation model (GCM)–CRM interfaces for provision of user-relevant forecasts. To demonstrate the applicability of CRMs, we present two examples for El Niño/Southern Oscillation (ENSO)-based forecasts: the onset date of the wet season (Cairns, Australia) and total wet season rainfall (Quixeramobim, Brazil). This study emphasises the methodological aspects of CRMs rather than discussing merits or limitations of the ENSO-based predictors.